March 19, 2019 - Teck has released its 18th annual Sustainability Report, covering the company’s performance in 2018 and progress towards its short-term sustainability goals set for 2020. Teck’s approach to responsible resource development is guided by a sustainability strategy, which sets out a vision as well as short- and long-term goals in six areas of focus: Our People, Community, Water, Energy and Climate Change, Air, and Biodiversity. “Our sustainability strategy has helped to strengthen our performance across key areas such as greenhouse gas reductions, water stewardship, and biodiversity. We are on target to achieve our 2020 sustainability goals and also working to set new goals to guide our approach in the decade ahead,” said Marcia Smith, Senior Vice President, Sustainability and External Affairs. 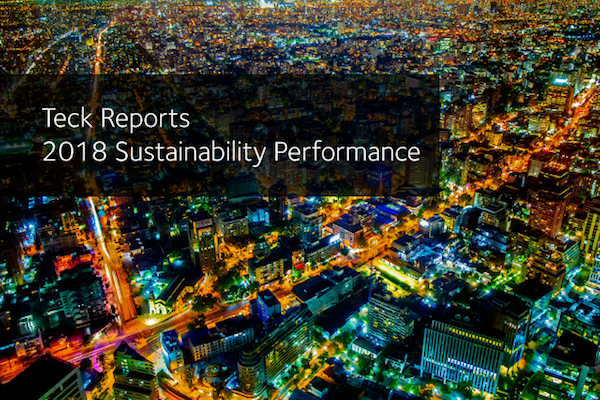 Teck’s Sustainability Report was released at the same time as its Annual Report. This is the first time the company has published both their financial and sustainability performance simultaneously. Both reports are available on the Teck website. Other reports available from Teck include its Economic Contribution Report and its Climate Action and Portfolio Resilience Report, available on its Disclosure Portal. Teck is a diversified resource company committed to responsible mining and mineral development with major business units focused on copper, steelmaking coal, zinc and energy. The pursuit of sustainability guides Teck’s approach to business. Teck is building partnerships and capacity to confront sustainability challenges within the regions in which it operates and at the global level.